Do you get a little boring and sleepy looking at the same icon images and styles for the many shortcuts located all over the desktop, Taskbar, Start, Windows Explorer, File Explorer and so on everyday? Another way to further beautify Windows and make the visual appearance more lively and interesting is by personalize and change the graphic image of the shortcut icons. 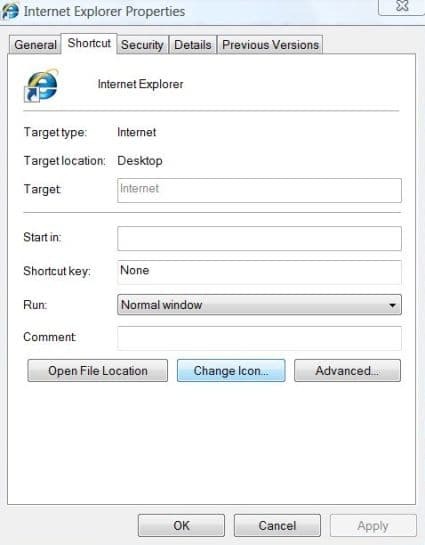 The following guide on how to change icon for shortcut in Windows operating system, using Internet Explorer shortcut as an example. Locate the shortcut (usually there is an arrow on the bottom left corner) which you want to change its icon image, and right click on the shortcut. Click on Properties on the pop-up contextual menu. In the shortcut’s Properties window, click on Shortcut tab if you’re not already on the tab. In the pop up “Change Icon” dialog, select a new icon to represent the shortcut from list of icons available. If you feel that the selection of icons available is not enough, or you have your own creative icon, or have downloaded an icon file, you can select icons from other application program or use your own icon. To do so, click Browse button, and select other icons file or program or libraries with icons. Click OK twice to exit when done. Now take a look at the effect of the new icon on the Internet Explorer shortcut, which looks more unique and interesting.